Kingston, Jamaica, May 6, 2014. 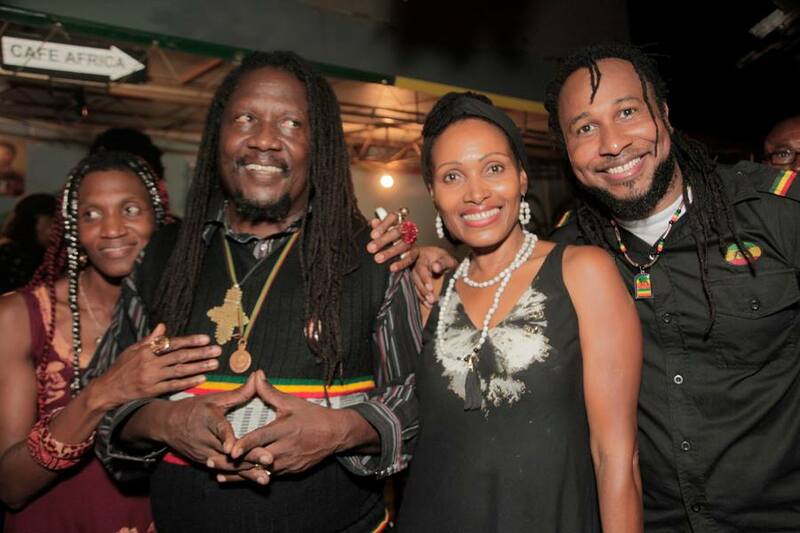 There were several legendary firsts which occurred at the recently held Conscious Reggae Dance Party that captivated those in and outside of the Café Africa venue this past Friday night May 2, 2014. The ‘Back to Africa Sankofa’ Party was incorporated within the Conscious Reggae Dance Party as a Fundraiser for the Gambia Roots Homecoming Festival and its delegation of 17 which departs the island on May 8, 2014. It was the first time that Denise “Isis” Miller the founder and producer of the Conscious Reggae Series produced a “Back to Africa Sankofa Party” in the true spirit of the Africana Renaissance showcasing “Africa as the Center of Attraction”. She added the dance feature as a new twist, but it was not the only ‘Sizzle’ that evening. The Conscious Reggae Dance Party was designed for dancing, flavored with live performances of Luciano, Mikey General, Sizzla Kalonji, Aaron Silk, Jah Servant, Papa D, Kertise and Empress Itilifyah. Mutabaruka, the cultural griot (social historian) for the Roots Homecoming Festival was one of the two music selectors; the other was DJ Marshmallow. Both rendered outstanding sets, turning Café Africa into a virtual mini replica of an African country through the lyrical sounds of reggae, the heartbeat of Jamaica. Steven Golding, Reggaelutionary speaker, set the stage for the sizzle to come, as he became a reincarnation of Marcus Mosiah Garvey in his delivery of his powerful message. Sharon Parris-Chambers, poet, shared a stirring tribute entitled: “The Sacred Feminine calls Africans to return to the Motherland”. As one of the featured Messenjahs, Sizzla Kalonji presented a captivating message of empowerment seasoned with intermittent hit songs, which kept the audience spellbound for up to one and a half hours. He was the true ‘Sizzle’ of the evening. He captured our imaginations, stretched it, took it apart and put it back together calling for unity in thought, right action, creating a vision of self-reliance. He urged the audience to support development and not look to others when as a people, we can commit to our own community developments. He used the commitment to his Nyabinghi tabernacle as an example of community development and empowerment in action. Living in a global world precipitates the lifestyle of a global citizen. In this perspective, Luciano and Mikey General, founders of Jah Messenjah Productions shared their experiences in The Gambia. Their oratory and lyrical musical feast shared a few memorable hit songs: “It’s Me Again Jah”, “Lord Give Me Strength” (Luciano), African Story & “Miss Taylor Boy” (Mikey General), to name a few with an ecstatic audience. According to Prince Deandre, host of Oxygen on Bess FM Radio, the Conscious Reggae Dance Party was historical. He spoke about it at length from beginning to the end of his show on Monday 5 May on Bess FM Radio(100 FM). In his supportive role, he seized the opportunity to play the Roots Homecoming YouTube video produced by Olimatta Taal & Damien Baddy in its entirety. The Gambia Roots Homecoming Festival has lit a fire across Jamaica as the Call to Action from the Motherland has taken root in its creations.